OREM, UT--(Marketwire - May 1, 2008) - Xlear Inc., the leading manufacturer of xylitol products, today introduced two new sizes to its line of Xlear Saline Nasal Spray with Xylitol products, formerly named Xlear Nasal Wash. The patented nasal spray is now available in 0.75 ounce bottles for kids and adults. The Kid's Xlear Saline Nasal Spray with Xylitol comes packaged in a colorful new box featuring a small elephant that will serve as the new caricature represented on all of Xlear's products for children. Xlear is America's best selling nasal spray with xylitol, and the only product on the market with an effective amount of xylitol to clean and soothe dry, irritated nasal passages caused by colds, allergies, and other nasal irritations. The patented, all-natural solution is designed to enhance the body's natural cleansing processes by flushing out bacteria, airborne allergens and pollutants that are inhaled through the nose. As the key ingredient in Xlear, xylitol helps prevent pollutants, pollens and certain bacteria from adhering to the nasal tissues and sinuses while increasing the natural moisture flow process in the nasal passage. Xlear nasal spray can be used as often as needed by adults and children. It is non-medicated and non-habit forming, and has no side-effects or artificial preservatives. The spray can be used daily and year-round for preventive care. "These new additions to our Xlear Saline Nasal Spray product line provide our consumers with additional choices that will benefit both children and adults," said Blaine Yates, chief executive officer of Xlear, Inc. "Xlear is a natural cleanser and moisturizer that has proven to help everyone from adults who suffer from allergies to children with chronic ear infections. Xlear's success is no accident as people around the world are enjoying the natural cleansing and moisturizing benefits. With our new compact product offerings, we have made it easier for adults and children to use Xlear whenever they need it and from wherever they are; whether getting ready to board a plane or go to daycare." Washing the nose with a hyperosmolar solution, such as Xlear Saline Nasal Spray with Xylitol, helps to flush out irritants that can lead to ear and sinus problems. Xlear also helps to cleanse and moisturize the nasal passage, enhancing the body's own natural defense mechanisms. Because Xlear is all natural, it also helps reduce the dependence on over-the-counter or prescription medications. 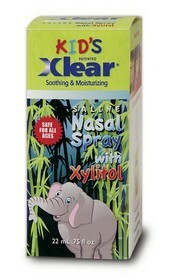 For more information about Xlear Saline Nasal Spray with Xylitol, please visit Xlear.com. Xlear is available nationwide through Xlear's several thousand retail partners, as well as at Xlear.com. Founded in 2000, Xlear, Inc. (pronounced "clear") is recognized as one of the leading manufacturers of xylitol products, and one of the largest importers of xylitol in the United States. Xlear, Inc. is committed to providing consumers with the health benefits of xylitol by manufacturing all-natural, health-enhancing products. Xlear, Inc. offers Xlear Saline Nasal Spray with Xylitol, an award-winning, patented saline and xylitol solution; a complete line of dental health products under the Spry Dental Defense System brand; XyloSweet, raw xylitol crystals used as a sugar substitute in cooking, baking and general consumption; and Fine & Dandy Candy, a growing line of healthy, xylitol-based candies. Xlear, Inc. is a private company with headquarters in Orem, Utah.